We have lots of printable reading games for elementary grades. This colorful game board will have your third, fourth and fifth graders reading and working with lots of interesting verbs. Be sure to view the screen shot of the board, then print the pdf. Print the game board and word cards. 1. 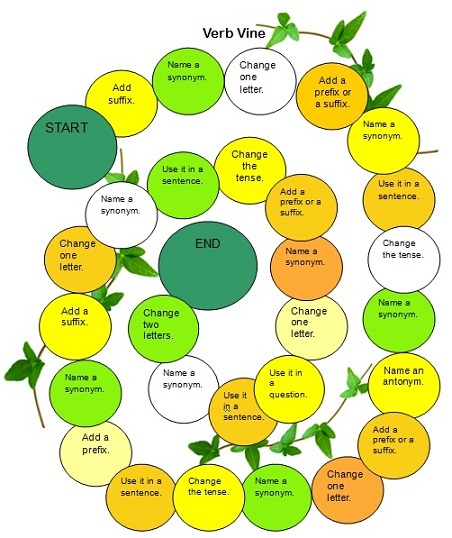 Print and laminate the game board and word cards. Cut the cards apart. Give each child a game piece to move around the board. 2. Shuffle the cards and place them face down on the table. 3. Player 1 rolls the dies and moves forward that number of spaces. He draws a word card and tries to make a new word, following the instructions on the game board. For example, if he rolls a 2 and draws the word forget, he might give overlook, or not remember for his answer. If a player is unable to think of an answer, he goes back to where he began that turn. Note: It is not always possible to perform each task on every word. His turn is over. 4. Other players follow in turn. 5. If players use all the cards before the game ends, the cards should be shuffled and reused. 6. The first player to reach the END wins. Players do not have to reach it on an exact count. Quick Draw - Kids must follow directions and draw simple objects correctly. Accurate reading comprehension is a must! Students can add additional directions, making this a game to reuse throughout the school year. Four Score - Build reading and writing skills with this fun activity. This game gives students practice using antonyms. What's Missing and News Clues - Games your upper elementary students can play in small groups. Target Time - Target practice has never been this educational! Use this fun format for your upper grade students to practice their reading fluency. The game board can be used for other skill practice as well.